A simple to use app that provides a combined calendar containing all of the race dates for popular motorsport series’. Individual session dates and times are provided (where available) in an aggregated calendar, featuring only your favourite championships. Each event has a countdown timer so that you never miss out. Your bespoke calendar can also be added to the Calendar app if preferred. Series calendars that are featured include: Australian Supercars, Blancpain Endurance, Blancpain Sprint, British RX, British Superbikes, BTCC, DTM, F1, F2, Formula E, GP3, IndyCar, NASCAR, MotoGP, Moto2, Moto3, VLN, WeatherTech SportsCars, WEC, and World SBK with more being added. If you used our previous Motorsport Calendar app you will be able to login with your existing details and still have your favourite sports selected. NB. Calendar dates require an active subscription to be purchased. 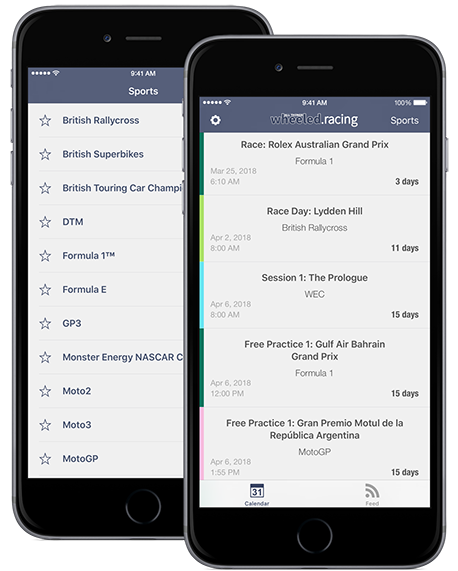 A subscription enables viewing of all race dates in the app and via an internet calendar. The names used in this app are copyright and/or registered trademarks of their respective companies. This app is unofficial and is not associated in any way with the Formula One group of companies. F1, FORMULA ONE, FORMULA 1, FIA FORMULA ONE WORLD CHAMPIONSHIP, GRAND PRIX and related marks are trade marks of Formula One Licensing B.V.